It is often desirable to mute a microphone easily — for example, a musician might need to mute the mic clipped onto an instrument when it’s not being used on stage, or a producer might want to control an extension talkback microphone. There are myriad applications when you start thinking about it. From a technical perspective, the best way is to mute the line-level output of the mic’s preamp with a relay or electronic switch, but that’s not always very convenient — sometimes the switch needs to be close to the mic and wired directly into the mic cable. The traditional solution in such cases is to short together the hot and cold sides of the mic’s balanced output with a switch, and there are countless passive switch boxes of this form on the market. However, while this approach works adequately with dynamic mics, it usually produces rather nasty clicks if phantom power is present on the cable, so it’s not a great solution when working with capacitor mics. 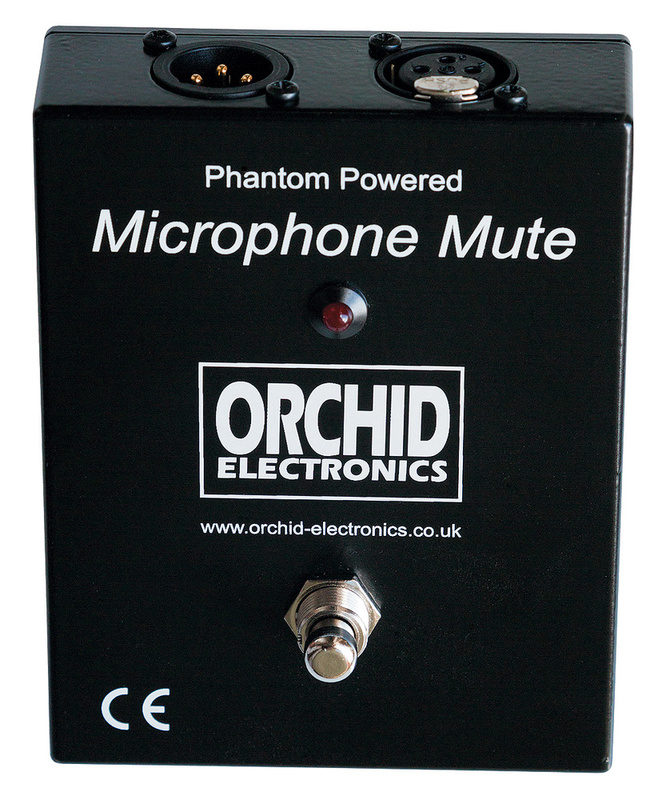 The clicking can be reduced with the addition of a few passive components, but a really quiet system requires a rather more sophisticated approach, and that’s precisely what Orchid Electronics have done in the phantom-powered Microphone Mute and the Mic Mute Lite products. Needless to say, the Lite version is the simpler of the two, with just a pair of XLR sockets to connect the unit into the cable run between microphone and preamp, and an electronically latched footswitch on the top panel to activate the mute — indicated by a bright red LED. The Mic Mute Lite is housed in a small 300g aluminium die-cast box measuring 120 x 95 x 35 mm, with a non-slip foam pad on the bottom. The more elaborate version is designed primarily for use with miked-up instruments on-stage, but it is a versatile unit with many applications. It supplements the basic facilities of the Lite model with two actively buffered, unbalanced, quarter-inch instrument-level outputs. One follows the muting condition and is intended to feed the mic signal to a stage amplifier, while the other provides an ‘always-on’ output for a tuner (or other device). The top panel again features an electronically latched footswitch with associated LED, and the sturdy die-cast case is a little larger at 145 x 120 x 45 mm. The miniscule power needed for the internal switching circuitry (and buffers) comes from normal phantom power, supplied by the mic’s preamp or mixer, and this is also passed on to the microphone, of course. When first connected to a phantom supply both models power up in the muted state, with the red LED illuminated to indicate that everything is working and ready for use. Internally, the Mic Mute Lite is very nicely engineered with a lot of attention to detail to ensure a long and reliable life. The ‘silent mute’ functionality is achieved with a FET-based ‘relay’ specifically designed for low-level analogue signals, and it effectively shorts together pins two and three of the output XLR in a controlled way that minimises clicks. The larger model also incorporates a small bridging transformer to split off the microphone signal, which is then amplified to feed the two unbalanced instrument-level outputs, one of which is has its own mute circuit which follows the microphone signal’s muting. My Audio Precision bench tests of a Mic Mute Lite pedal revealed a small residual attenuation of the mic signal when unmuted, amounting to about 2.5dB. This is not significant in normal applications. With the muting circuit engaged, the attenuation at 1kHz reached a tad over -60dB (but was slightly dependent on the source and destination impedances), decreasing by 10dB at 20Hz and increasing by the same amount at 20kHz. In practice, this amount of attenuation is quite sufficient, and the mic can be considered to be switched off for all normal intents and purposes. There’s no significant increase in noise or distortion, and no headroom limitation, imposed upon the microphone through signal. 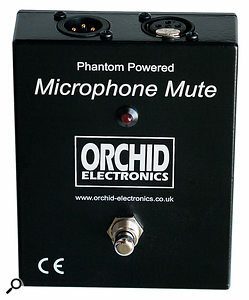 As I’ve come to expect from Orchid Electronics, the Mic Mute Lite worked just as claimed. The review model imposed a tiny low-level thud when muting, and a tiny click when unmuting, both being somewhat dependent on the audio present at the time of the switch activation. However, there’s no audible degradation to the microphone signal at all (other than a barely noticeable drop in level), and no audible breakthrough when muted. It’s a simple device which works well, and you quickly wonder how you ever managed without it because it’s so handy to have around! I gather that the more elaborate Mic Mute model is very popular with folk fiddle players and country music players in the USA, Canada and elsewhere around the world, and I can certainly see the attraction. It has also found applications with vocalists and instrumentalists for ‘looping’ purposes, splitting the signal to feed a looping effects pedal (with either a mutable or permanent signal, as appropriate). Mic Mute £68, Mic Mute Lite £56. Prices include VAT. Balanced Microphone Mute £68, Balanced Mic Mute-Lite £56. (About $89 and $107 when going to press). Prices exclude shipping from the UK.